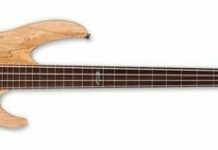 The 5-string bass guitars are noted for their extended lower range, a characteristic which is absent in other bass guitars. They further provide more noted for a single hand position. Because of this, they are widely used a variety of musical genres including rock, pop, jazz, heavy metal, and blues. Since 5-string bass guitars are essential instruments, you must be mindful of the instrument to buy. On this article, we are going to identify ten of the best 5-string bass guitars in the market. Moreover, we will list down the characteristics which each of the products possesses. This Fender Vintage 5-string bass guitar has all of the hallmarks of what you’d expect from a classic five-string bass. One of the first things that you have to do as a musician is to identify the characteristics which should be present on a typical 5-string bass guitar. This way, you will be able to choose the right instrument that would be functional and accurate to your needs. Here are two of the features that you should look for when picking the best 5-string bass guitars. One specific thing that you must take into account when looking for 5-string bass guitars is the material which was used. It should be noted that the wood chosen for the guitar would affect its weight and tone so you have to consider how you will use your bass guitar. Mahogany basses, for instance, are known to be warm. Maple, on the other hand, produces a bright and crisp tone. Alder and ash are similar tone woods which provide a balanced tone. The fingerboard of the 5-string bass guitar should also be considered. A coated fingerboard helps create a fretless sound and a longer sustain. Such feature would wear much longer when used with round-wound strings. On the other hand, an uncoated fingerboard has a warmer and more natural sound than the former. The features which were mentioned above are just some of the key features that you should take into consideration when picking the best 5-string bass guitars. It is worth noting that the end choice will still be dependent on your preference as the player. The first instrument on our list is the Squier By Fender Vintage Modified Jazz Bass Electric Bass Guitar. This 5-string bass guitar is noted for its traditional jazz bass tone which is delivered by two single coil pickups. Its rich look and presentation are brought about by its vintage tinted gloss neck with block inlays. Additionally, it is noted for its superior sound and feel which would suit today’s bassists. It is available in various colors including amber sunburst, candy apple red, Olympic white, and 3-color sunburst, among others. The Yamaha TRBX505 TBN 5-String Premium Electric Bass Guitar is another exceptional bass guitar which is noted for its solid mahogany body which ensures durability and strength. It is also characterized by its five-piece maple/mahogany neck, a black nickel hardware, and active-passive electronics with battery alert LED. Its design delivers flexibility and tonal quality that would allow you to sculpt the ideal sound for your music. This 5-string bass guitar is available in 19 different colors including root beer, translucent black, bright red metallic, and matte amber. The Ibanez 5 String Bass Guitar is an affordable and lightweight bass guitar that is ideal for a beginner or an experienced musician. It is noted for its lightweight body, smooth neck, and perfectly matched electronics. Additionally, it also features a sleek and comfortable maple neck and its solid bridge, making it more playable. Such guitar also consists of Dynamix P & J pickups and Active PHAT II EQ which adds additional low-end power. 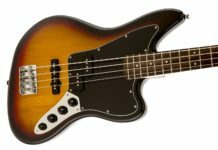 The bass guitar is available in different colors such as weathered black, roadster orange metallic, deep violet metallic, and natural gray burst. 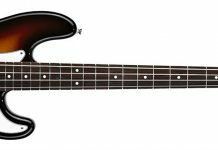 The Fender Standard Jazz Electric Bass Guitar is a perfect choice for any musician who is seeking to upgrade to a professional level bass guitar. This instrument is equipped with two modern style single-coil Jazz bass pickups which provide clear and articulate tone. The tinted C shape neck offers universal comfort and a vintage style. It has reduced hum as provided by the shielded body cavities. It comes in various styles namely: V string, maple fingerboard, and Pau Ferro. It is also available in five different colors. The Ibanez GSRM25BK GSRM25 5-String Bass Guitar is another great choice for bassists who are looking for functional yet inexpensive bass guitars. It is characterized by its fast and slim maple neck, and its compact and lightweight body. These features give bassists comfort and versatility, as well as ensuring them of a durable instrument that would last a long time. This 5-string bass guitar has been built in a shorter scale, making it perfect for space-restricted home studios, tour buses, and musicians with smaller hands. The Schecter Stiletto Studio-5 Electric Bass combines Euro-High Tech looks with upper-register playability, making it perfect for many styles of playing. Its neck-thru beautifies consist of an exotic Bubinga top which is finished with a natural honey satin finish. This bass guitar has been armed with EMG HZ pickups and a mid-control on the 3-Band EQ. Moreover, it consists of 24 frets, diamond custom bridge, offset dots inlay, and Schecter tuners. This bass guitar is available in two colors: HSN and STBLS. The Rogue LX205B 5-String Series III Electric Bass Guitar is characterized by its basswood dual cutaway body which ensures durability and strength. It also features a bolt-on maple neck with rosewood fingerboard, delivering fat slabs of classic tone and a smooth play. Such bass guitar also has a high-mass adjustable saddle bridge and dual volume and tone controls. Its J-style pickups offer massive slabs of classic tone. Musicians will surely love its great sound and consummate playability of this 5-string bass guitar. The Schecter Stiletto Custom-5 Electric Bass has been characterized by its sheer strength and elegance. It has been built on the concept of the Stiletto Studio, with added flash with a natural or vampyr red satin maple top and a gold or black hardware. These features would guarantee that you will not go unnoticed when you are performing on stage. This 5-string bass guitar with EMG pickups, deliver precision and strength. Its mahogany, on the other hand, adds to the rich tone of the instrument. The Ibanez SRFF805 Multi Scaling 5-String Electric Bass Guitar is noted for its fret-to-bridge distances which enhance tonality and create a better sounding bass. It features an ash body with a deep double-cutaway shape and cool black stained finish. It also consists of a super-slim and fast-playing multi-scaling Jatoba and Bubinga neck and 24 medium-sized multi-scale rosewood fingerboard with block position inlays. This is a superb bass guitar for musicians who demand only the best 5-string bass guitars on the market. The last instrument on our list is the Yamaha BB235 BB-Series 5-String Bass Guitar. This is noted for its solid alder body, a vintage style bridge, custom V3 ceramic pickups, and lightweight open gear tuners. Its sound has also been recognized because the guitar is able to provide a more resonant and organic tone and feel. Aside from its sound, the guitar is noted for its durability and playability, making it a great choice for beginners and expert musicians. It is available in various colors including vintage white, translucent matte black, and midnight blue. It is worth noting that 5-string bass guitars are essential in any rock or jazz bands. Being the backbone of your musical pieces, these instruments should be chosen carefully and intricately so that your performance would be stellar. Hence, you should scrutinize each of the products well so that you would be able to identify each of their distinct differences and arrive at the best 5-string bass guitar. Additionally, by gauging each of their characteristics, you will be able to choose the instrument that would suit your style the most.